United States and Canada - All Deliveries to the United States and Canada will be made by UPS. You will be quoted the shipping cost and presented with delivery options at the time of checkout. See our shipping calculator for more information. Also available for Duramax, Powerstroke and Cummins. Check their respective catagories. It is a left hand thread (reverse thread), meaning you turn the nut to the right to loosen.The Wicked Wheel is balanced at the Factory. Turbo balancing after installation is not necessary. Please watch the instructional video below and contact us with any questions. Installation error is not warranty and this wheel is not returnable once it's seal is broken. Will not fit Aftermarket/imported turbos. We now have one available for aftermarket turbos such as our ssd-2988, p/n ssd-WW65A. 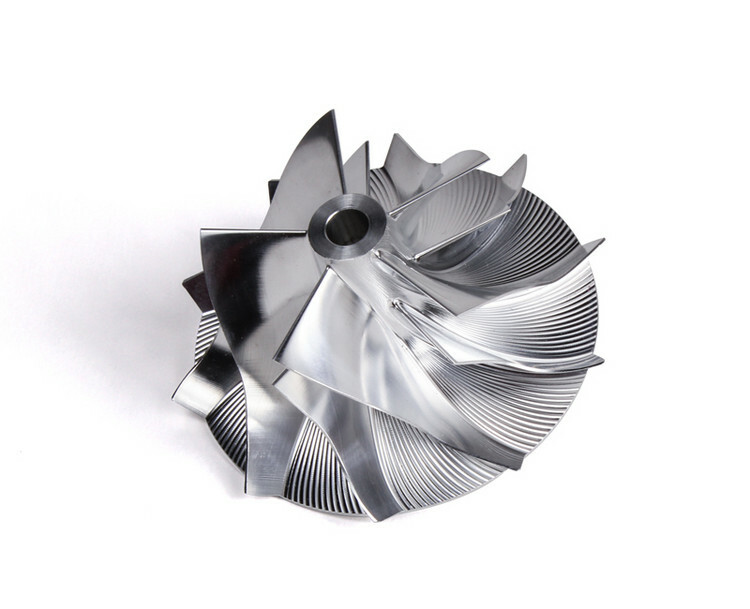 Our goal with this project was to create a more efficient turbocharger. When we talk about a turbo's maximum recommended boost levels, we base that on the rpms the turbo needs to turn in order to create said boost. When you increase boost without increasing rpms or drive pressure, the load on the turbocharger is the same for the elevated boost as is was for the original lower boost number. The best part is when you run at lower pressures, like you would in daily driving conditions, the drive pressure/ boost pressure ratios are always lower, which should in turn result in longer turbo life, not less. Using a billet (Machined from solid aircraft grade Alcoa A2000 series aluminum) compressor wheel has two distinct advantages. Weight/Mass reduction-because the Wicked Wheel is made using 5 axis CNC, and because of the high quality aluminum, we are able to take much material out of the wheel to make it lighter. The OE wheel is made of cast aluminum. Any time you cast something, you are limited to the design because of process of the casting. By making it lighter, the overall mass or weight of the turbine assembly is less and thus takes less force (fuel/exhaust gas) to move/spool. Design of blades- the OE has a very difficult challenge when they manufacture a vehicle. They have to set the tuning and performance to work “pretty good” in all conditions. It has to work in extreme cold, in extreme heat, at sea level, at high altitudes, etc. all the while trying to protect the vehicle to get through the warranty period. The same turbo is also commonly used in various applications. So many times, the turbo did not match the engine as best as it could. They improved with tuning, or doing something to it for a better fitment. The aftermarket quickly finds the soft areas and improves on these quickly. The same is true with the compressor wheel. It is made of cast aluminum, which is very economical to produce, and the design has to work “pretty good” in all conditions. Keep in mind 5 axis CNC technology (at least to produce economically) has not been available until the last 5-10 years. The design of the wheel can now be changed to better meet the demands of the engine/vehicle. Similar to a boat impeller, we can change the pitch, blade count, taper the tips, increase blade heights, use trailering angles, etc all designed to maximize air volume and pressure into the combustion chamber to burn fuel. Our designs come from 3D imaging the stock cast wheel, then looking at the compressor housing to see how much we can increase the blade height to grab more air. We also look at other factors in how much to angle the blade, taper the blade to maximize air flow. When we dyno tested the 2 prototype wicked wheels, we found the 6x6 bade increased HP by 10 and the 5x5 increased by 14. But the road test was really the determining factor on why we settled on the 5x5. The lower the blade count, the more bottom end you will get. The higher the blade count, the better for top end. We felt the responsiveness on the 5x5 for bottom end and mid-range was great. We didn’t know of too many applications (especially with eh 6.5L that customers would be willing to sacrifice the bottom end to get better top end (high RPM). Going to a 7x7 or 8x8 would be really laggy on the bottom end. This would be magnified when towing. During our testing we measured both drive pressure and boost pressure. (see photos). Engine compartment picture is measuring drive pressure and fuel pressure during WOT runs on the dyno. NOTE: Wicked Wheels are not a returnable item once the seal is broken on the package.